Flight to Venice or Treviso airports. Transfer to your hotel (40 minutes from Venice airport, one hour from Treviso) for two nights half board accommodation in Lido di Jesolo, a resort town with 10 miles of beach. After breakfast, you set off for a full day excursion to nearby Venice. There is a 40-minute coach transfer to Punta Sabbioni for the scenic boat trip across the lagoon – you arrive close to Piazza San Marco. After a walking tour with local guide, you will have time to explore the world’s most romantic city, the city of canals and islands. You return to your hotel, again by boat and coach, in time for dinner. Today you drive east towards the border with the former Yugoslavia. Your main stop today is Trieste, once the major port of the Habsburg Austro-Hungarian Empire. While the maritime republic of Venice was the most important sea-trading centre of late medieval Europe, Trieste’s docks and dock yards were the outlet to the sea for the mighty Austrian Empire until WWI. After WWII, it was carved up between Italy and Yugoslavia, the main city being Italian. The wide avenues, squares and baroque buildings date from the early 18th century. Your entry into Trieste is an unusual one: a 25-minute ride on the hybrid tram and funicular railway from Vila Opicina, which descends 326m, with great views as it goes, and arrives right in the heart of the old city of fine buildings and spacious squares. You will have a guided tour of the town – have your photo taken with the statue of James Joyce (who lived, wrote and drank here for 10 years) – and visit the ornate, beautiful Miramare Castle, seat of Maximilian from the time of the Austro-Hungarian Empire, and with stunning sea views – as its name would suggest. You cross into Slovenia and head for the mountain resort of Kranjska Gora in the Upper Sava Valley, for four nights half board accommodation. 218 miles today. Free in Kranjska Gora to enjoy the dazzlingly beautiful valley with two included excursions. 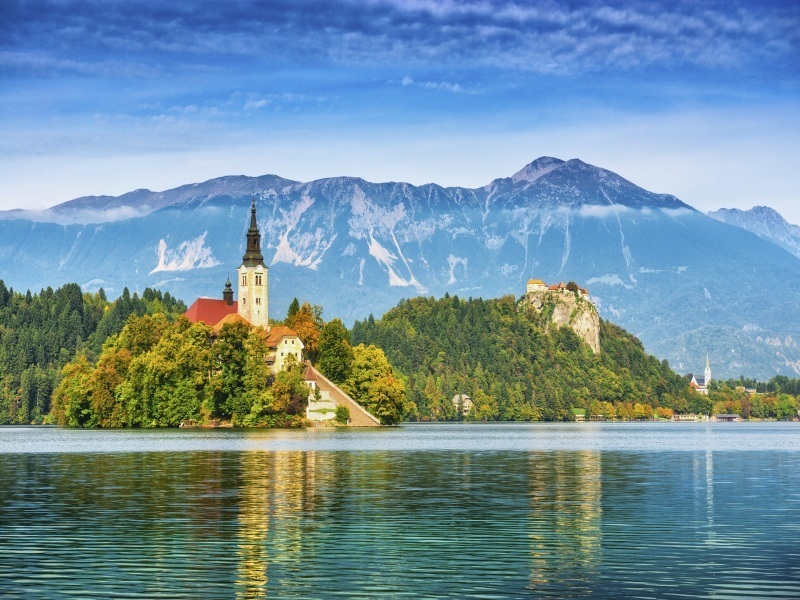 The first excursion is to Lake Bled and the Slovenian capital city of Ljubljana (or, if you prefer, spend the whole day at Lake Bled). Just half an hour away from Kranjska Gora is the shimmering magic of the lake. You can spend the whole day visiting the famous castle and the very pretty 15th century church on Bled Island and relaxing. Or, after time for a coffee and a stroll you can continue to Slovenia’s capital, with its town hall, cathedral, castle, parks and old quarter. Ljubljana was a Habsburg city, and evidence of this period can be seen in its skyline although many buildings were destroyed in the earthquake of 1895. Nowadays the architecture is a pleasant blend of Baroque, Art Nouveau and the wonderful buildings and bridges of Jože Plecnik. After a walking tour and boat ride through the city, you have free time until you return to Lake Bled and thence to Kranjska Gora. 120 miles return to Ljubljana, 50 miles return to Lake Bled. The second excursion is over the border to the Austrian region of Carinthia – a land of azure lakes, set before a backdrop of alpine splendour and unspoilt towns and villages. You will see three lakes – Faakersee, Ossiachersee, and Worthersee, where you will have time to explore the lakeside town of Velden. 74 miles today. Today you leave Slovenia for Italy. You cross the border and head to Udine, an interesting city with a long history. A Roman city in origin, it stands at a crossroads of languages and cultures: a mix of Italian, Slav and German elements, with a castle and stunning, marble, Romanesque Duomo. From there you continue back to Lido di Jesolo for one nights half board accommodation. 153 miles today.